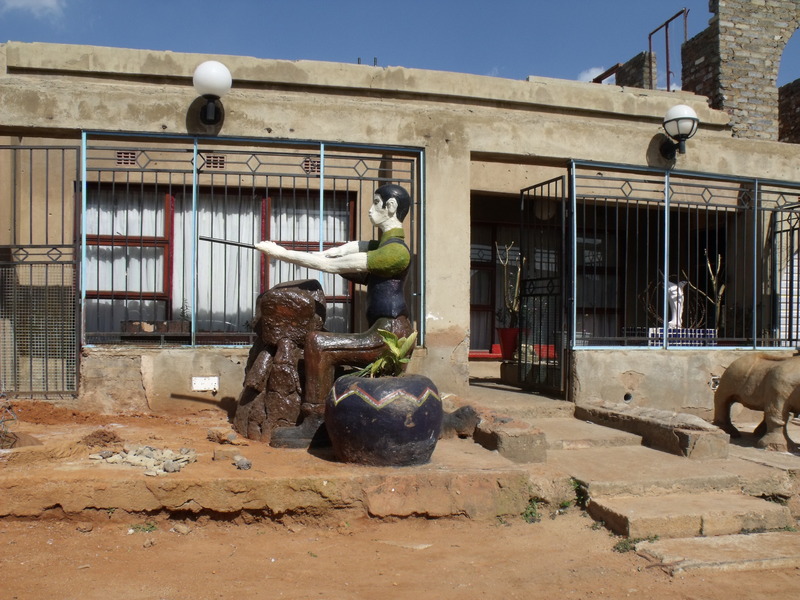 Today Gregory Maqoma takes us on a personal tour of Soweto — his hometown. 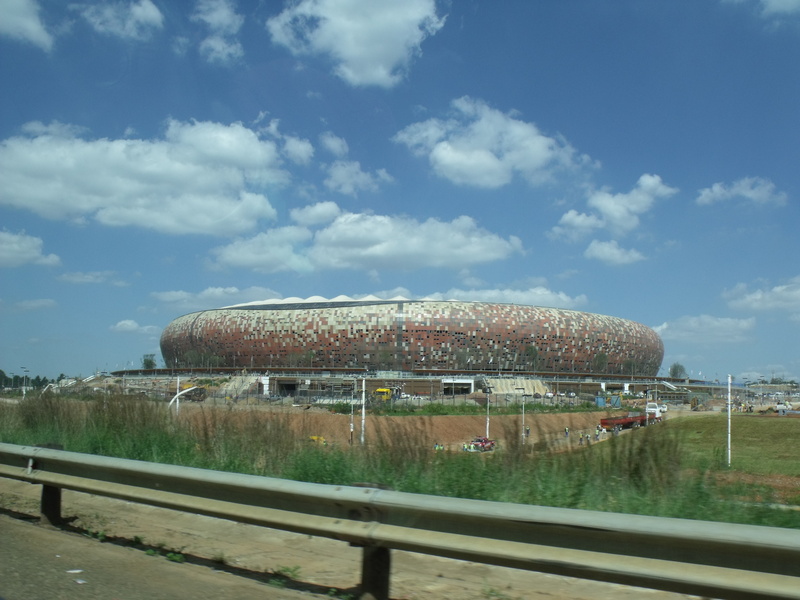 In fact it is the hometown of most of the black people we have met. 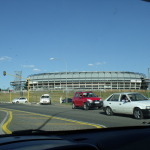 It is about a 20-minute drive east of Joburg on a good day with light traffic. 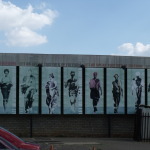 Soweto has a population of about 4 million. 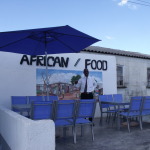 It is the largest black township in southern Africa and is quite a bit larger than Joburg. It is comprised of several zones. 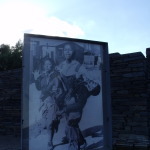 Since apartheid the streets have been paved and the homes, many built by the government, have been improved a great deal. Of course some areas are much nicer than others and there are still some squatter villages of corrugated metal shacks that are really dismal. But, there is also a brand new, very upscale mall complete with a giant soccer ball! 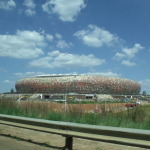 The three new soccer stadiums built for the World Cup are all on the way to Soweto and are quite impressive. We cover al lot of ground in three hours. 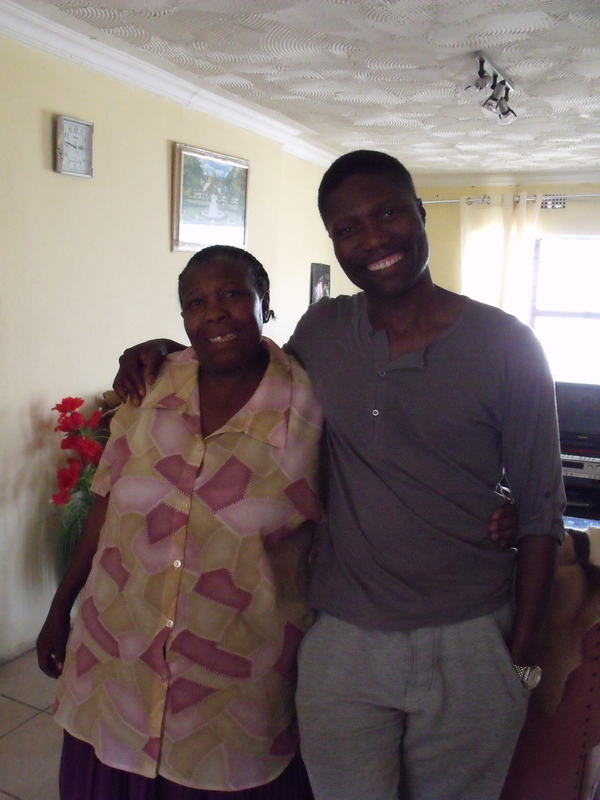 First stop is to visit Gregory’s home to meet his mother and brother. He has helped them to create a lovely home with three separate buildings around a courtyard, all the modern conveniences, surrounded by a secure wall and gate. Everywhere from the wealthiest suburbs to the poorest neighborhoods people have walls often topped with razor wire or spikes to deter intruders. 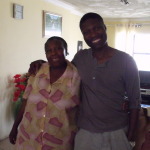 In my field so rarely do we meet the families of those we work with. Meeting Greg’s Mom is a treat. She is warm and lovely. She gives us some of her delicious corn muffins that take the place of lunch and keep us going through out tour. 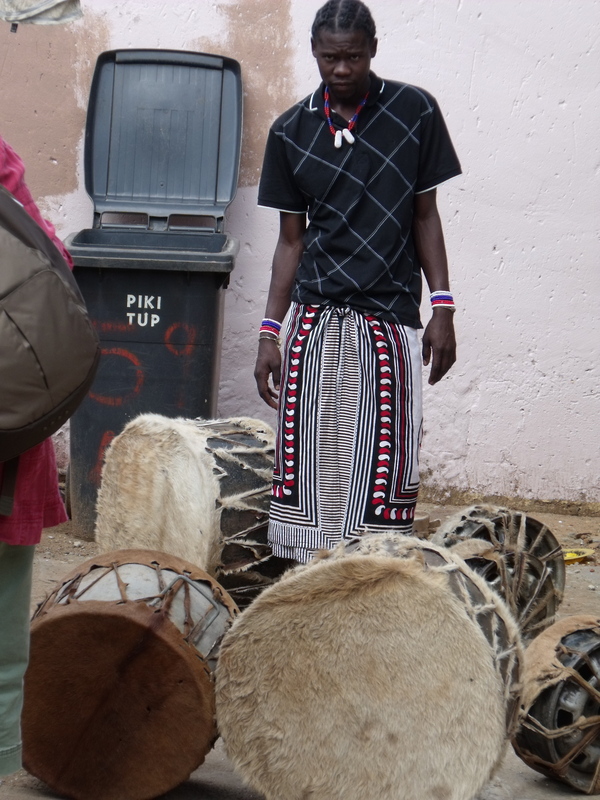 Greg’s younger brother has just been initiated as a sangoma, a traditional healer. 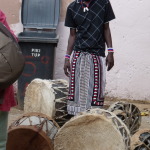 He is building drums from 50 gallon metal barrels and cow skins. 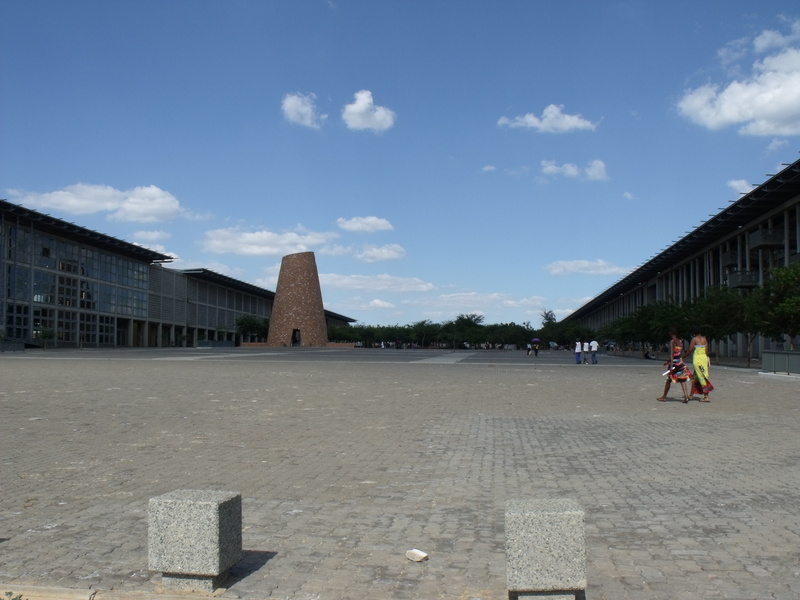 Our next stop is Freedom Square built to honor the triumphant resistance movement led by the ANC and dedicated to Walter Sisulu, co-founder with Nelson Mandela of the ANC. 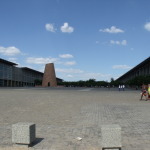 It is an enormous plaza flanked by two incredibly long tall buildings. It was designed to give a sense of space and freedom from wherever one stands within it. Along one side is a busy market street with many small shops as well as an open air food market with colorful piles of fruits and vegetables. This feels like a hub – it is dense with people buying food, getting haircuts, doing errands and socializing. It is Sunday so most folks are not working. Everywhere we go along the roads people are walking or waiting in the hot sun for taxis. One must drive or be driven to and fro as the distances are far. Most depend on crowded taxi vans to commute to work. 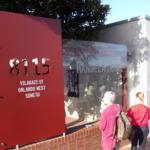 Our next stop is the place where Gregory and Vincent first got introduced to dance and began to practice their moves. Its’ a hostel where the migrant workers still live and where dance competitions used to be held on weekends — its’ a pretty depressing, rundown place. 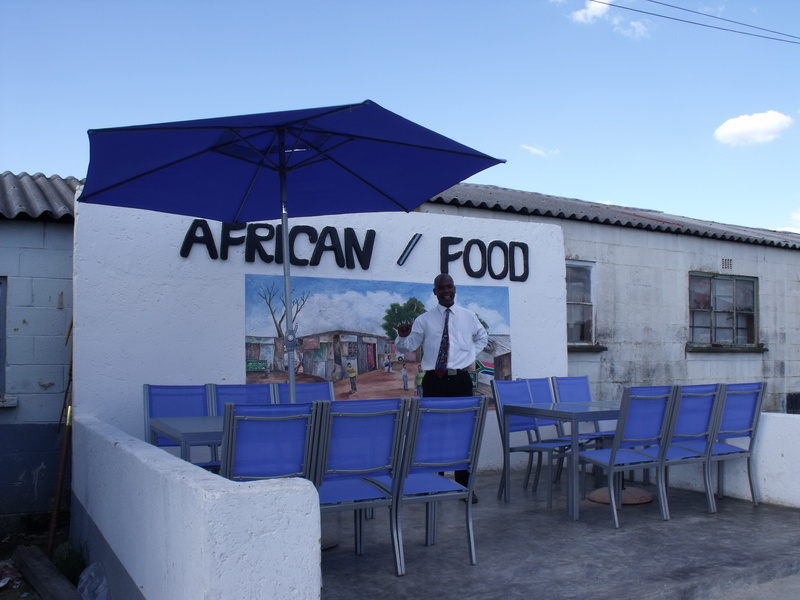 We stop for a drink at an open-air restaurant in the complex– a favorite among locals – that serves every part of the cow. 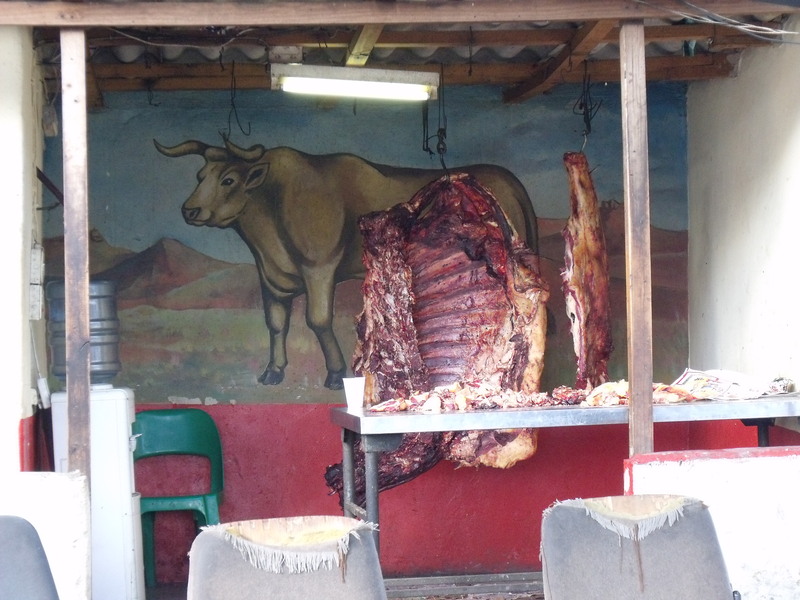 Everything is on display—a half a cow carcass is hanging in one alcove. Through a crack in the walls we can see where they are butchering. 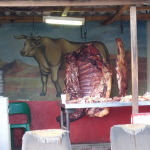 In another shack they are preparing and cooking the entrails. There are big grills going where meat is being barbecued. Tables are set up for the diners and there is a small store where you can buy drinks. To our ‘oh so health conscious’ American palettes this is pretty scary — meat, meat and more meat with almost nothing to accompany it but some potato salad. The flies and filthy surfaces where everything is prepared are enough to put one off eating for a while. But, its’ amazing what a stomach can endure—its all a matter of what you’re used to! We also stop at a community center—each zone has one. Most have a variety of spaces for different activities like a library, sewing center, gathering space, art rooms, etc. 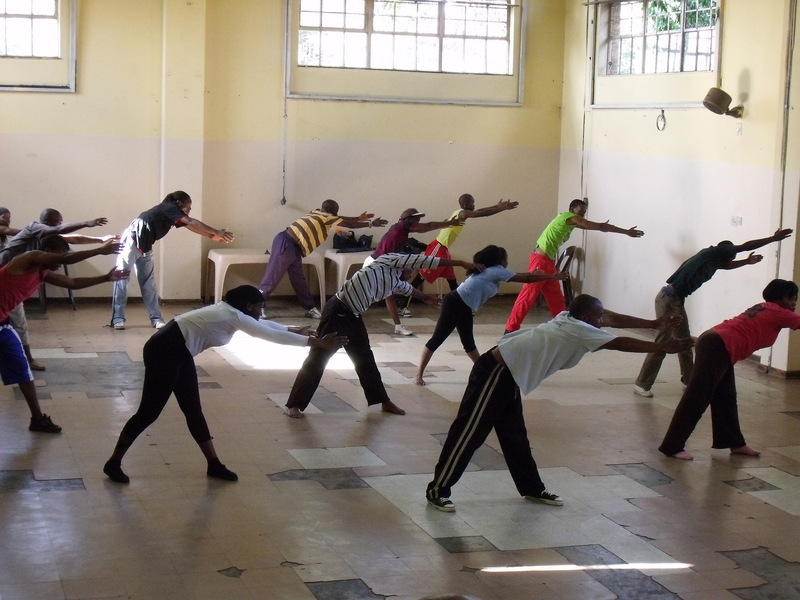 We are lucky and find a modern dance class in progress. There are three drummers accompanying and about 20 students of all ages and levels of experience. I am surprised by the contemporary nature of the material being taught. This center is large, one of the older ones and a bit shabby. Some are brand new and very spiffy as are some of the schools. There has been a lot of development in the infrastructure and yet Greg says the government is still building the same crummy matchbox houses for people. 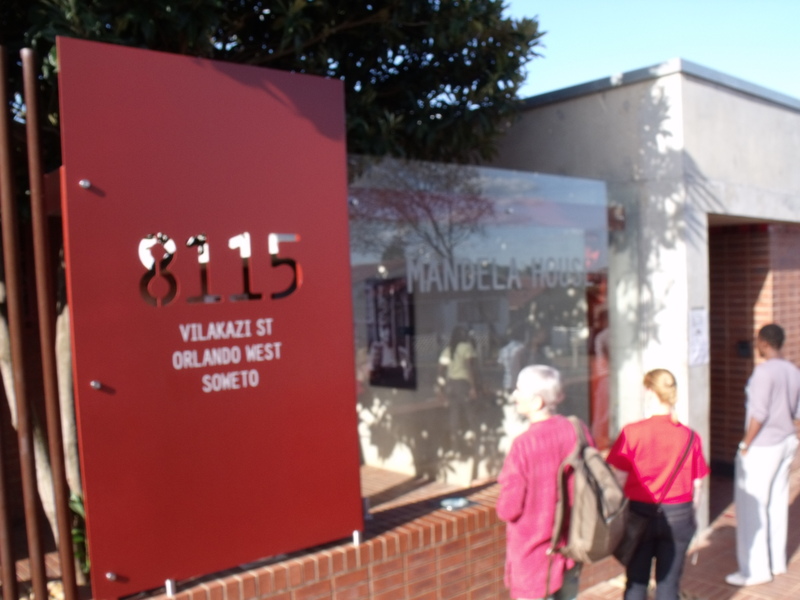 We move on to the home of Nelson Mandela – a must see although there isn’t much to it. This is where he and Winnie first lived when they were married. It is now a museum and the neighborhood around it is jokingly called Beverly Hills. Its’ gotten pretty swanky with cafes and guesthouses. 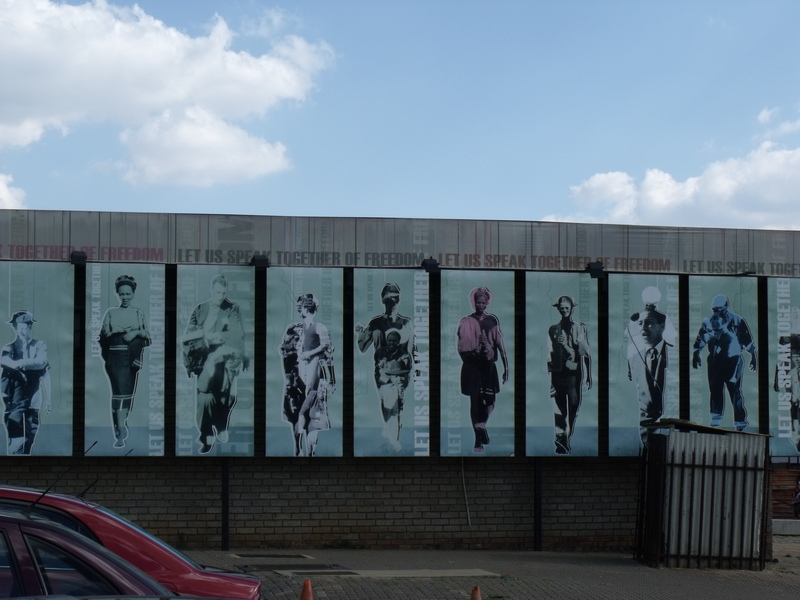 Another very important landmark is the Hector Pieterson Museum built to commemorate the young teen who became the iconic figure of the youth struggle. He was made famous by a photograph seen around the world. 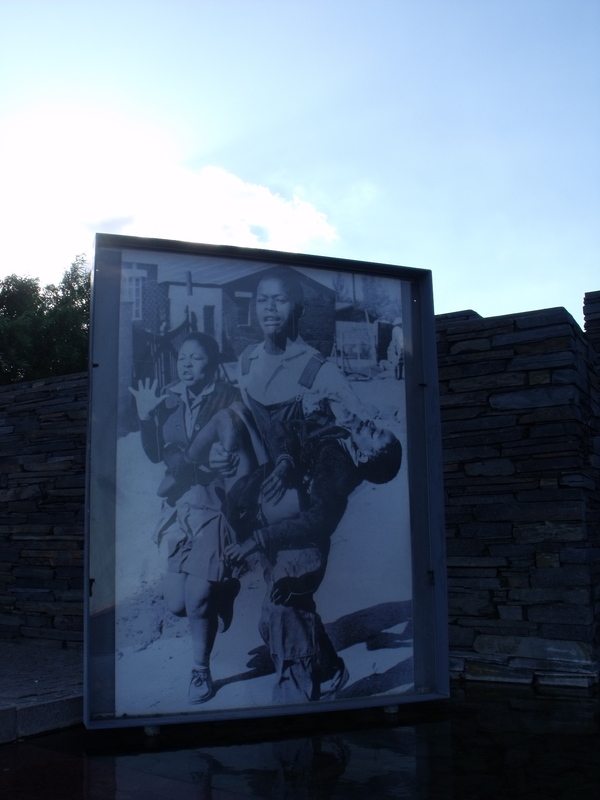 In it he carries a wounded child through the streets of Soweto during the youth uprising. 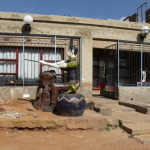 It is a beautiful museum and landmark that sits on a hill overlooking the township. This was the site of the uprising and of Hector’s tragic death. There is a monument of stonework and water that includes the famous image. Also in the complex is another community center where Greg has often performed. In this place, as in Freedom Square, the weight of history is heavy. I feel the presence of struggle and grief — but also the incredible power of the multitudes that risked and lost their lives in the fight for freedom and equality. It is one thing to read about these events from afar. It is quite another to stand it the place where history was made. 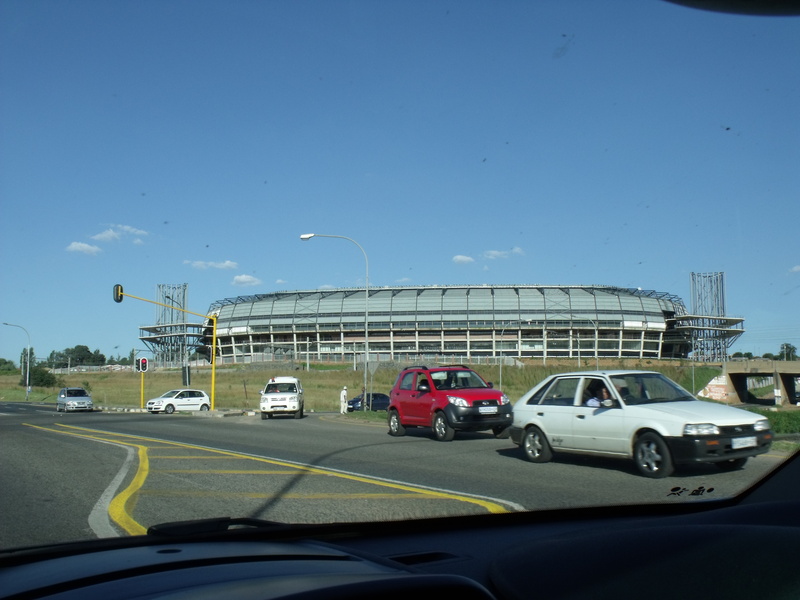 We return to Joburg for the evening’s performance. 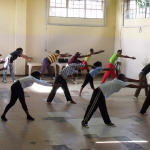 The triple bill features, Lucky Kele, who was a residency artist at Bates in 2006 & 2007. From my visit with Lucky yesterday I learn that the piece grew out of an encounter Lucky had in which he came upon a young woman giving birth on the street. It was a terrifying, bloody experience. The piece is about a baby girl child and the agony and abuse she suffers in the world. The set includes a wall upstage left, painted with a chaotic abstract design in red. Upstage right is a bloodied board on which lays some sort of undecipherable creature. A second performer who appears to be a kind of sage dressed in a robe, speaks a text most of which I cannot make out. Lucky is a tortured soul who dances out the agony. It is wrenching.